Sticky Cleaner is a new promotional product for marketing and publicity purposes. 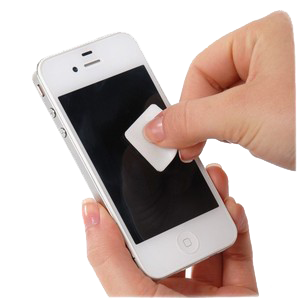 Every time someone uses a mobile phone, the Sticky Cleaner will be seen by its user and the people nearby! The Sticky Cleaners are delivered on a card that can be adapted to your personal needs or wishes. The upper layer of the Sticky Cleaner is made from a microfiber cleaning cloth with a fully customizable full colour digital print. The lower layer is made from an environmental friendly semi-adhesive gel which makes it possible to stick the Sticky Cleaner to, for instance, the back of a mobile phone, tablet, camera or PDA, to have it available whenever you need to clean the screen or lens. The Sticky Cleaner can be stuck to virtually every phone or tablet's flat surface. Of course, large screens get dirty just like small ones and that's why the Sticky Cleaner is also available in a bigger size for use on computer-, laptop- and television screens. It is possible to adapt the size and shape to your personal design. For more information about the possibilites, please contact us.